Why should you make tuna your next meal choice? Simply because it's packed with vitamins and nutrients. Many people know eggs and meat contain a good source of protein, but did you know tuna is also a high source of protein? Protein is good for the blood, skin, nails and hair. Along with all those health benefits, the avocado comes packed with many too! Avocados make the list of superfoods because of the rich amount of nutrients and vitamins such as calcium, iron, magnesium and vitamin A and D. This salad is perfect to eat right before a workout. Its full of protein and energy in the tuna and avocado which will keep you going during your workout session. A good way to incorporate tuna is trying this simple, low-calorie tuna avocado salad. Place tuna in a small bowl. 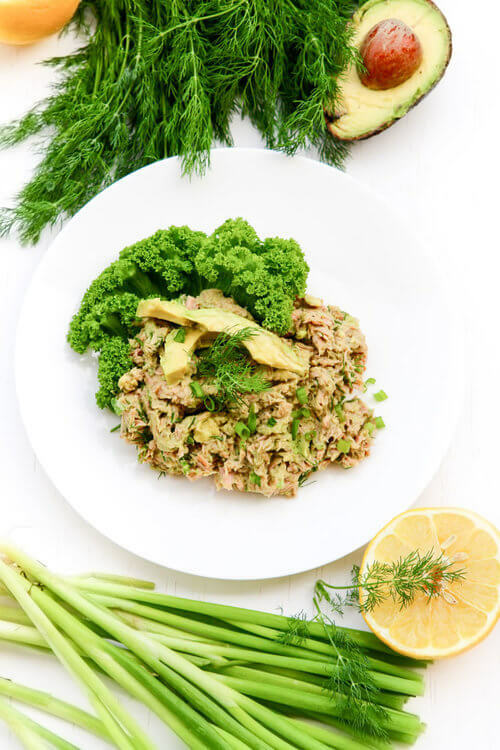 Mix tuna with 1 avocado, 1 chopped green onion, a stem of fresh dill, juice from 1/2 a lemon, 1 Tablespoon of extra virgin olive oil and a pinch of salt and pepper. Give it a good mix, and enjoy!